Regardless of where anyone is straying, we're likely to go to Kerava by train. For that purpose, here's a great graphic of the local trains in and around Helsinki. Since most (all?) of us are staying in central Helsinki, here's a map of the tram routes, as by tram is by far the best way to get around in central Helsinki (unless you prefer to walk, which is great too, as Helsinki isn't huge). Here's a pdf tram map on which it's particularly easy to find the Central Railway Station as it's marked with a comment. Below is a detail of the map to whet your appetite. Transforming tram map. Click to enlarge. 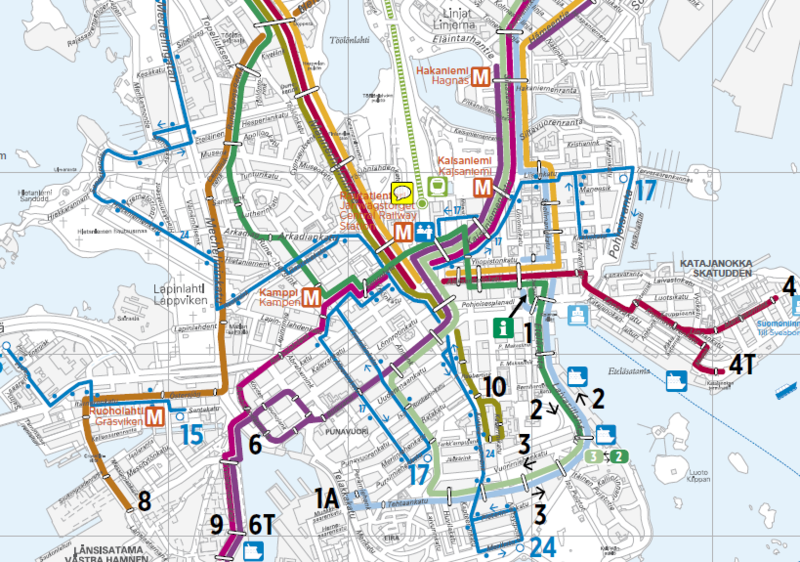 And here's a link to a tram map (pdf) without any comments at all, if you prefer to pretend you already know everything about Helsinki. This map is key regardless of where we are staying. Click to enlarge. OK, not so much fantastic other stuff, no. But when we come up with more stuff, we'll definitely stick it here. OK, so for those who might be staying in holiday cabins at Rastila Camping (the Old Barbarians from Tallinn wew flirting with this option until real life intervened and they mostly had to cancel), or who are really keen on karaoke, there's the metro map to ponder. And here's the explantion of the Bold / Not so bold station names on the Magnificent Metro Map. The name in bold is the Finnish name of the station, the unbolded one is the Swedish name. And because Finland is tourist-friendly, the Central Railway Station is named as such in English as well.